We’ve been looking at vacation places for our next trip. 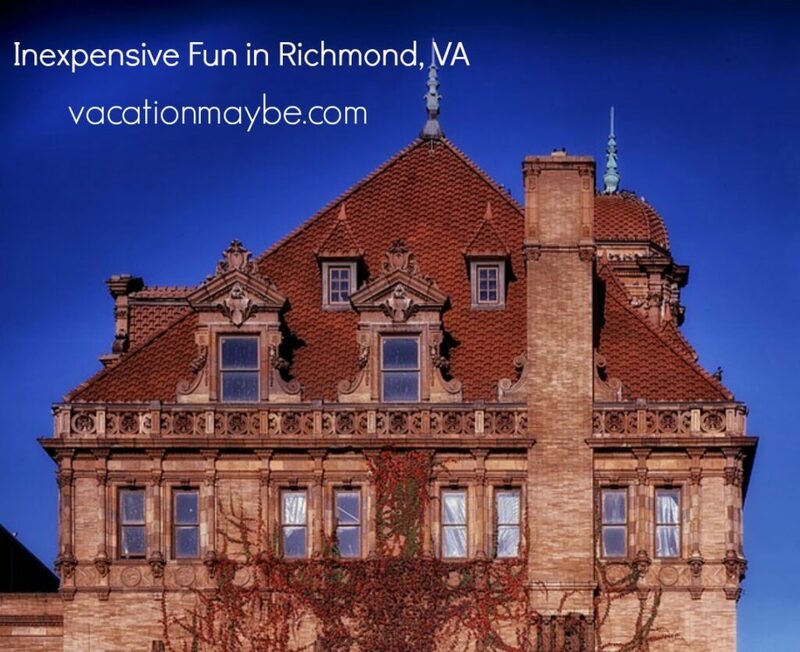 Richmond Va popped up and I wanted to see how many fun and cheap places there were to visit in the area. While compiling the list I thought I was probably not the only one looking. So here’s my list for you! Let’s have some inexpensive fun in Richmond, VA.
1. The Capital Building 9th & Grace Sts, Richmond, VA 23219 Learn about how Thomas Jefferson got the design ideas from a friend while staying in France. 2. St. John’s Episcopal Church 2401 E Broad St at 24th St, Richmond, VA 23223 Patrick Henry gave his famous speech here. Great history here too! 3. Virginia Holocaust Museum 2000 E. Cary Street Richmond, VA 23223, Richmond, VA 23223 A lovely space to visit and learn more about the horrors of the Holocaust. This is a free museum. 4. The Museum of the Confederacy 1201 E. Clay St., Richmond, VA 23219 This museum has so much to offer the Civil War Buff. It’s right next door to the Confederate White House. Hit two museums while parking only once. Great trip. 5. Monument Avenue from Lombardy Street to North Thompson Street, Richmond, VA 23220,23221 Great way to see the houses of that period and all the historical monuments. It’s free too! 6. Carytown 3166 W Cary St, Richmond, VA Fun, independent shops and restaurants. They feature handmade crafts and arts. Galleries, food and shopping oh my! 7. James River 22nd Street and Riverside Drive, Richmond, VA 23223 Go hiking and explore the rich history found along the James River. Kayaking, swimming, picnic by the river and just explore. This has gotten great reviews! This list is a great list of free or almost free things to do in Richmond. There seem to be lots of festivals that take place year round too. So that would be another way to go. Richmond is so full of history. It would be an excellent place to take the kids and explore and learn more about the Civil War.